Vacuum Technology Archives - Robolab Technologies Pvt. Ltd. The vacuum suction spider SSP is equipped with suction cups that are specially designed for the wood industry. The special structure of the bottom surface of the suction cup allows for extremely short cycle times and highly dynamic handling. Automotive glass has to be handled with particular care in a way that is also ergonomic for the user. Often, a number of different glass panels with different radii have to be sequenced or placed on a processing table, conveyor belt or gluing unit. The tube lifter Jumbo Flex with ergonomic one-hand operation is ideal for handling glass panels. 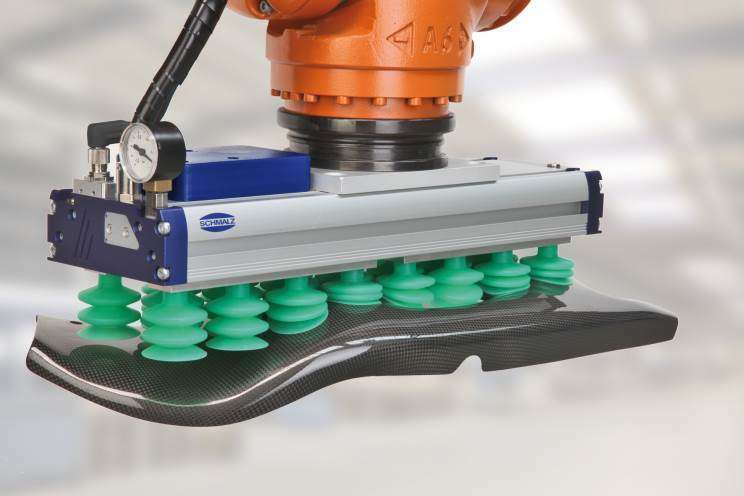 Special glass suction cups prevent any marks on the workpieces. The JumboFlex lets you rapidly handle up to 300 picks per hour. In this episode, we will explain how to remove and clean the filter screen and the integrated vacuum valve on the FMP-S area gripper system. A special FDA-compliant material is required when making direct contact with food products. A high flow rate is needed to handle dry food products like biscuits, cookies, cakes or waffles, because their surfaces and shapes are usually irregular and porous. The special gripper SCG Food features a contact element made from FDA-compliant silicone and a flexible sealing lip that ensures an excellent seal even on textured surfaces. The dirt-resistant vacuum generator provides a high flow rate and high leakage compensation. The flow gripper SCG is equipped with an antistatic suction cup. The flow gripper compensates for leakages e.g. caused by differences in height. The flexible sealing lip of the suction cup additionally compensates for differences in height. The suction cup is made of the antistatic material NBR.